Did Sen. Dianne Feinstein Say It's Unfair That Smaller States Count as Much as California Because of the Electoral College? - Truth or Fiction? A meme paraphrases the California senator about electoral representation, but it also distorts her comment. Sen. Dianne Feinstein said the Electoral College allows "smaller states get the same vote as California," which is "unfair." 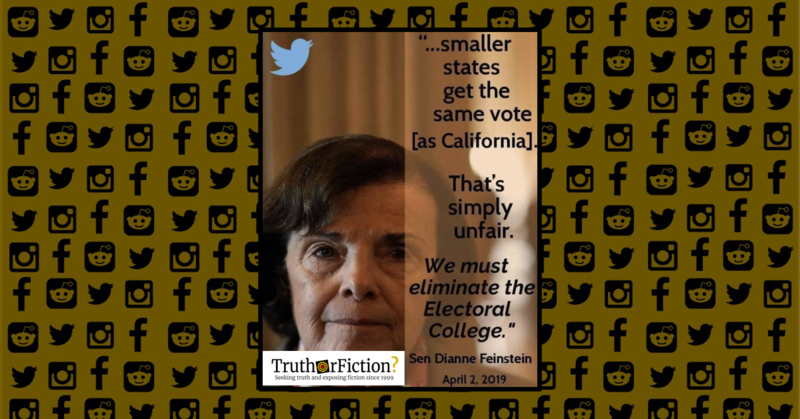 On April 4 2019, this meme was posted to a Facebook group (archived here) with a purported quote by Sen. Dianne Feinstein about California and the United States’ electoral college. “…smaller states get the same vote [as California]. Although a few elements matched the meme, Feinstein’s actual Electoral College-related quote left little room for misinterpretation, but was completely misrepresented anyway. In the meme, Feinstein was quoted as saying it was “unfair” that “smaller states get the same vote” as California. In her actual commentary, Feinstein said that a single Electoral College representative “stands for 712,000 California residents, but a small state like Wyoming gets the same vote for only 195,000 residents.” The meaning of Feinstein’s commentary on that day regarding the introduction of the Constitutional amendment was entirely stripped from the meme by its creator.